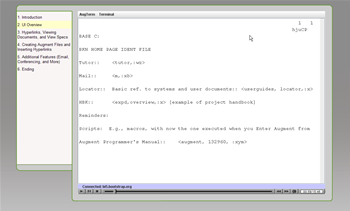 I've created a screencast showing Douglas Engelbart's ground breaking Augment software. This screencast takes viewers through many of Augment's amazing features, first implemented in the late 1960s, including hypertext, groupware, outlining, and more. If you have ever wondered what Augment looked like, and how it was the first to implement such features as email, then you should enjoy this screencast. Advanced hypertext features, viewing and browsing documents, and transforming documents using Augment's "ViewSpecs"
The full screencast is about 15 minutes long; there is a user-interface to jump right to particular sections if you are interested in just some features. This screencast is being produced as part of the Hyperscope project, an NSF-funded project to recreate portions of Engelbart's Augment system on the World Wide Web.